In direct contrast to the highlands that surround it, the Pashhow Marshlands are located near sea level, resulting in a wet, swampy landscape. 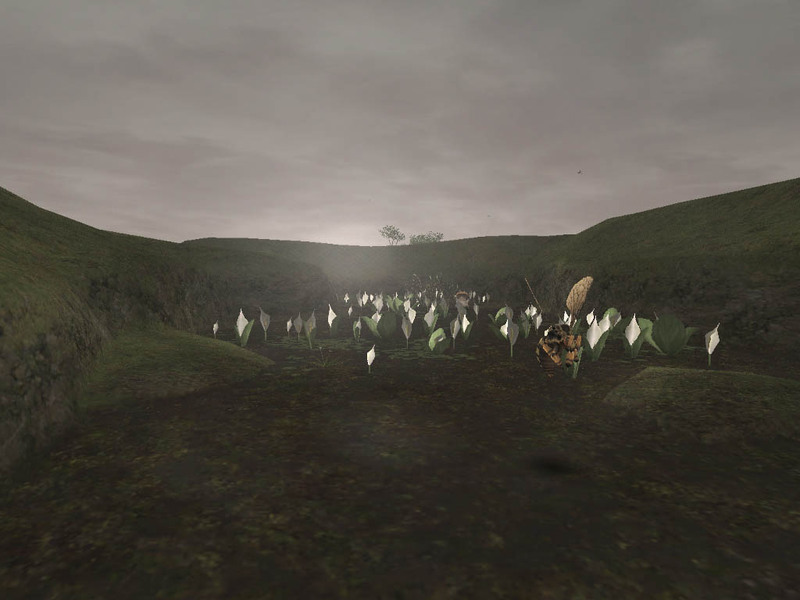 The countless bogs and floating islands of vegetation make the area extremely difficult to traverse. However, the presence of the Quadav is what causes many travelers to shun this dangerous territory. Brave adventurers often roam the marshy wetland hunting crawlers, goobbues and leeches. The Pashhow Marshlands connect with th Konschtat Highlands to the southwest and Rolanberry Fields to the northeast. An outpost provides shelter on the San d'Orian path to Jeuno. The Quadav stronghold of Beadeaux can be found toward the southeast edge of the map. Bloodpool Vorax, Jolly Green and Bo'Who Warmonger can be found here. The Echo Awakens, Shock! Arrant Abuse of Authority, and An Explorer's Footsteps are among the quests that utilize this zone. The Cavernous Maw in this zone is located at (K-8). This page last modified 2009-10-26 13:11:52. Ok has anyone else seen the Luck rune on the ground on the way to Beadeau? I'd love to find out what it is but no luck so far contrary to what the rune says it is. Clicking on it, was told, "It's your lucy day!" recieved a wind crystal for whatever (not windsday) reason. Surely it does more than randomly despense single crystals. My gf tried it at same time, got the "nothing out of the ordinary" message. Looking forward to it being figured out. These semi-unidentified things drive me nuts. What area do Thunder eles spawn? i can never seem to find one when its thunder storming. 1 usually spawns near the outpost, then one or 2 spawn near the luremarsh, infact you can probably find them near each marsh. If ya can't use it, sell it. If ya don't want it, sell it. if ya can't sell it, eat it. So should I be able to kill Marlboro's at lvl 34 RDM/18 BLM? I have good gear and I'm up to date on spells except Phalanx(for obvious reason's). You really shouldn't judge all Taru's by their cutenesses. ._. I'm a 32DRK/WAR and farm here with almost no down time. Goobues hit hard, of course, but I can still take them as long as I have about 150+HP before the battle. Marbolos are another story...if I'm 100% health, and MP...I can take them if I'm lucky. So I tend to stay away from them. So yeah...a dark can farm here safely, and Its the best place I've farmed so far. Just about any job level can make it to Jeuno if the player is good enough. I brought my rank 1 lev 15 war (no sub) to Jeuno to look around once when I first started playing. There is more than one lev 1 mule in Jeuno. Just wondering if a 32DRK/16THF could farm w/o much downtime??? I am a lv 40 drk and farm here and have very little downtime. The reason is because of my dark magic skill. Make sure it's high, cause it cuts downtime by alot. And when farming with drk make sure make sure your not using your all your xp equipment like RES gear cause any Def helps lower down time. yes but, When I farmed down here on my 40 samurai I still had quite a bit of downtime ,but then again I was killing 2 crawlers at a time. I'd suggest that you stay out till 42+. Especially if you're a drk X_X no offense. Some stuff down there will still be easy prey as a 32 drk. With Drain/Aspir, you can take down crabs as refreshers. SAM has no way to heal themselves aside from resting or subbing WHM. While DRK would be damaged more, they have the option of subbing, say, WHM, and curing themselves as well as Draining and Aspiring to avoid resting too much. I don't know about you guys, but my BUM uses TP - I can't be the only one?!?! Well I've come to the conclusion that this place is indeed good for farming ,but it has some strings attached. for one Bog Rabbits hardly drop anything good except hides and their name should be Bog Bunny... Lol . Two you must be at least 40+ to actually injoy the farming w/o to much down time and I could easily say that malboros do take a good class to take them down w/o much down time. My 41 Samurai doesn't have any trouble on them(Except "Bad Breath"). Goobues drop Tree clippings which sell pretty good. Over all Pashow is a good place to farm. But BCNM 40 is better money if you can get a group for it. Well I've come to the conclusion that this place is indeed good for farming ,but it has some strings attached. for one rabbits hardly drop anything good except hides. Two you must be at least 40+ to actually injoy the farming w/o to much down time and I could easily say that malboros do take a good class to take them down w/o much down time. My 41 Samurai doesn't have any trouble on them(Except "Bad Breath"). Goobues drop Tree clippings which sell pretty good. Over all Pashow is a good place to farm. But BCNM 40 is better money if you can get a group for it. The door to the outpost is now targetable. Is this a Ballista thing (Ballista was in progress at the time), or just something new? I went to Jugner shortly afterward, and that outpost door was not targetable. I've been trying to figure it out, but haven't had any success. Nobody in my LS knows either. I dunno whats up with these malboros im a lvl 40 Drk with great equipment and i can hardly kill one. They hit for 36 dmg every 1 second. The peppers you get from the harvest are for a quest in Windy, at the magic school. I bought one off of AH when I did quest, for about 600g I think. The quest gives you the Hypno Staff. Name of quest? I forget. It's no biggie though. I passed this place while making a mule in Jueno. And its really easy as long as youre careful. Same thing as rollanberry. I think my mule is the only person in ragnarok with the red ? on its head. Actually i tried this before when i wanted to blood warp with a lvl character. Why not die trying to go to Jueno??? As long as you have the map and you know where youre going and you know how to avoid aggro youre good. While partying my advance jobs in Dunes i can see people running thru goblins and then shouting "Gobs after me!!!!" .... "Stick to the wall for G*d's sake". I thought that I was just being paranoid when I followed the walls there. :P It's nice to know I'm not the only one. The Goobbues aggro here too, all the way into the mid-30's. Malboros and Goobbues are really, really hard to kill for anyone below level 35 or so, as well. They waste me with my 31 Thief. I saw the ??? in the Bloodpool Vorax area also. Used sickle 4 times, broke 1 and got no harvest. Maybe it's a Quest/Mission/Job thingie. You can't polish a ****! I tried harvesting there too.. 1st time my sickle broke, then a bunch of nothing harvested, then finally i got a bunch of burning peppers(?). Dont remember the exact name of the peppers but i think thats it. Its unstackable and sells for 1.5k in Midgardsormr. anyone know what sector beadeaux entrance is? Be a nonconformist like everyone else.